Audi has launched the base variant of the Q3, the Audi Q3 S Edition in India. It is priced at Rs. 24.99 Lakh, ex-showroom Delhi. Audi was the number 1 luxury car maker in India for the last year and the company wants to replicate its success this year as well. It may not have the volume cars such as A-Class, B-Class or the 1-Series in its line-up but what it has is an Audi Q3 which has been selling like hot cakes ever since its launch. The company is all geared up to launch the cut-price version of its baby SUV and has even started a marketing campaign regarding it. It is asking people to guess the price of the SUV and the one who guesses it closest to the launch price will get an all-expense paid trip to the launch party of the car. 5 others will get Audi merchandise. The cut-price variant will be called as Aufi Q3-S and it will hit the Launchpad on August 19. The company’s official website regarding the launch states that, “It’s an Audi at a never-before price. 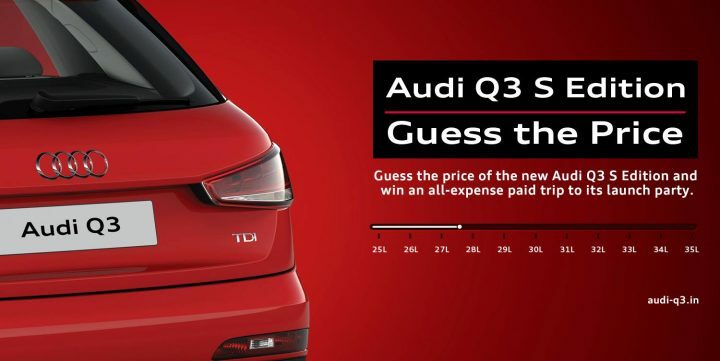 Guess the price of the all-new Audi Q Series SUV and win an all-expense paid trip to its launch party.” The company is expected to launch the SUV at a price tag pegged around the Rs 25 lakh mark and this is from where the guess the price meter on the website starts too. We will be reporting Live from Audi Q3-S India launch event in New Delhi, so stay tuned. Audi will increase the price of the Q3-S once it gets the word regarding the car going. The company has specifically mentioned that the car will be introduced with a launch price and launch prices usually see a northward revision after the companies garner a decent response for their vehicles. Audi Q3-S will be the least priced offering from the German luxury car maker and it is bound to generate a lot of buzz when it gets launched. What remains to be seen is as to what features will Audi forego to bring the price tag down. The car will be propelled by the same 2.0 litre diesel motor that powers the regular Q3 and develops a maximum power of 140BHP-320NM. It will be mated to a 6 speed manual transmission. August 10 is not really far enough and we shall come to know about the details about the car then. In the meanwhile, stay tuned to Car Blog India for all the updates in the Automotive world.